Since most of us spend a great deal of our lives working, it is inevitable that work plays a key role in shaping our levels of happiness. In a recent chapter of the World Happiness Report — published annually to coincide with the United Nation’s International Day of Happiness — we look more closely at the relationship between work and happiness. We draw largely upon the Gallup World Poll, which has been surveying people in over 150 countries around the world since 2006. These efforts allow us to analyze data from hundreds of thousands of individuals across the globe and investigate the ways in which elements of people’s working lives drive their wellbeing. Subjective wellbeing – often loosely referred to as happiness – can be measured along multiple dimensions. We look primarily at how people evaluate the quality of their lives overall, something Gallup measures according to the Cantril Ladder, an 11-point scale where the top step is your best possible life and the bottom step is your worst possible life. Gallup then asks respondents to indicate which step they’re currently on. We look at this rating, and also investigate the extent to which people experience positive and negative affective states like enjoyment, stress, and worry in their day-to-day lives, as well as analyzing responses to more workplace-specific measures such as job satisfaction and employee engagement. Eleven broad job types are recorded in the Gallup World Poll. The available categories cover many kinds of jobs, including being a business owner, office worker, or manager, and working in farming, construction, mining, or transport. Which groups of workers are generally happier? The first thing we notice is that people working blue-collar jobs report lower levels of overall happiness in every region around the world. This is the case across a variety of labor-intensive industries like construction, mining, manufacturing, transport, farming, fishing, and forestry. People around the world who categorize themselves as a manager, an executive, an official, or a professional worker evaluate the quality of their lives at a little over 6 out of 10, whereas people working in farming, fishing, or forestry evaluate their lives around 4.5 out of 10 on average. This picture is not only found for overall life evaluation but also for the specific, day-to-day emotional experiences of workers. White-collar workers generally report experiencing more positive emotional states such as smiling, laughing, enjoyment, and fewer negative ones like feelings of worry, stress, sadness, and anger. These descriptive statistics represent the raw differences in happiness across job types. Of course, there are likely to be many things that differ across people working in these diverse fields that could potentially be driving these happiness differentials. Perhaps surprisingly, much of the picture remains similar even once we adjust our estimates to take into account differences in income and education as well as a number of other demographic variables like age, gender, and marital status. Being self-employed has a multifaceted relationship with wellbeing. When we look at global averages, we see that self-employment is generally associated with lower levels of happiness as compared to being a full-time employee. But follow-up analyses indicate that this very much depends on the region of the world that is being considered as well as which measure of subjective wellbeing is under consideration. In most developed nations, we find that being self-employed is associated both with higher overall life evaluation and with more negative, daily emotions such as stress and worry. It will most likely come as no surprise to anyone who owns a business that being self-employed can be both rewarding and stressful! One of the most robust findings in the economics of happiness is that unemployment is destructive to people’s wellbeing. We find this is true around the world. The employed evaluate the quality of their lives much more highly on average as compared to the unemployed. Individuals who are unemployed also report around 30 percent more negative emotional experiences in their day-to-day lives. The importance of having a job extends far beyond the salary attached to it. A large stream of research has shown that the non-monetary aspects of employment are also key drivers of people’s wellbeing. Social status, social relations, daily structure, and goals all exert a strong influence on people’s happiness. Not only are the unemployed generally unhappier than those in work, we find in our analyses that people generally do not adapt over time to becoming unemployed. More than this, spells of unemployment also seem to have a scarring effect on people’s wellbeing, even after they have regained employment. 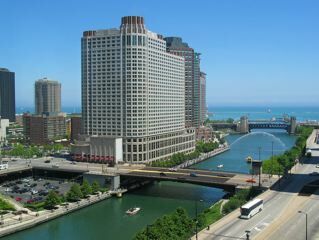 The experience of joblessness can be devastating to the individual in question, but it also affects those around them. Family and friends of the unemployed are typically affected, of course, but the spillover effects go even further. High levels of unemployment typically heighten people’s sense of job insecurity, and negatively affect the happiness even of those who are still in employment. So far, we have discussed how people evaluate and experience their lives as a whole. But what about more specific workplace wellbeing measures, like job satisfaction? The Gallup World Poll asks respondents a yes/no question as to whether they are satisfied with their jobs. The percentage of respondents who reported to be “satisfied” (as opposed to “dissatisfied”) were higher in countries across North and South America, Europe, and Australia and New Zealand. Specifically, Austria takes the top spot with 95% of respondents reporting being satisfied with their jobs. Austria is followed closely by Norway and Iceland. 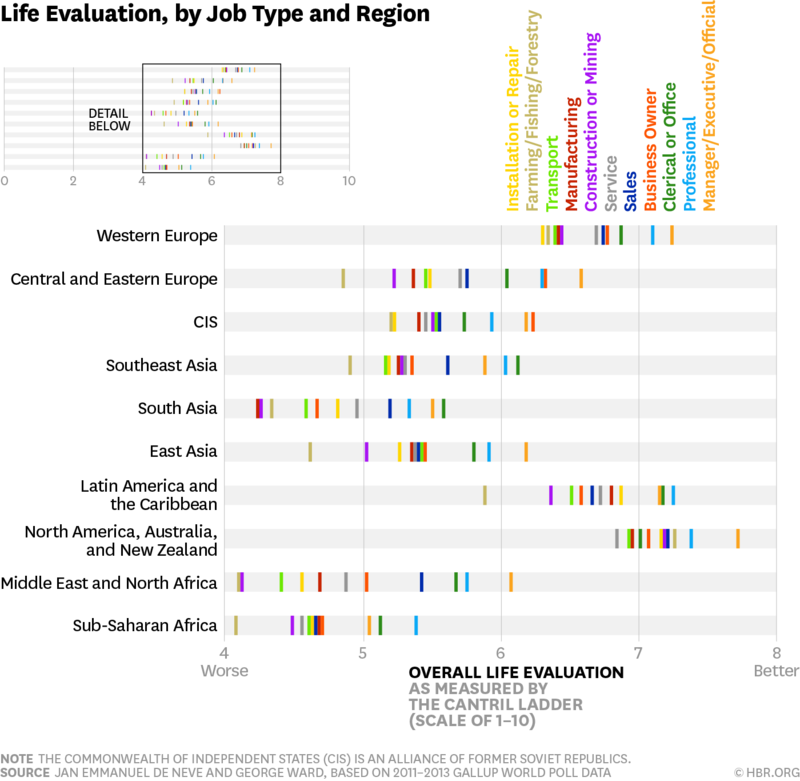 We see a moderate correlation (0.28, where a perfect correlation would be 1.0) between job satisfaction responses and life evaluation for individuals in the Gallup World Poll. To find out why some societies appear to generate greater job satisfaction than others, we turned to the more fine-grained data from the European Social Survey. This can give us more information on job quality by revealing particular workplace characteristics that relate to employee happiness. As might be expected, we find that people in well-paying jobs are happier and more satisfied with their lives and their jobs, but a number of other aspects of people’s jobs are also strongly predictive of varied measures of happiness. Work-life balance emerges as a particularly strong predictor of people’s happiness. Other factors include job variety and the need to learn new things, as well the level of individual autonomy enjoyed by the employee. Moreover, job security and social capital (as measured through the support one receives from fellow workers) are also positively correlated with happiness, while jobs that involve risks to health and safety are generally associated with lower levels of wellbeing. We suspect that countries that rank high in terms of job satisfaction provide better quality jobs by catering to these non-pecuniary job characteristics. The Gallup World Poll asks whether individuals feel “actively engaged,” “not engaged,” or “actively disengaged” in their jobs. In contrast to the relatively high job satisfaction numbers, these data paint a much bleaker picture. 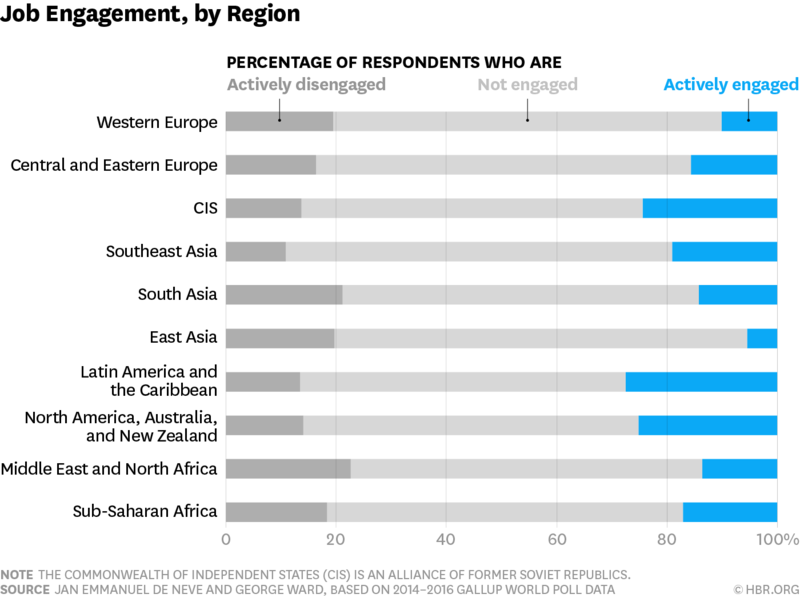 The number of people noting that they are actively engaged is typically less than 20%, while being around 10% in Western Europe, and much less still in East Asia. The difference in the global results between job satisfaction and employee engagement may partially be attributable to measurement issues. But it also has to do with the fact that both concepts measure different aspects of happiness at work. Job satisfaction can perhaps be reduced to feeling content with one’s job, but the notion of (active) employee engagement requires individuals to be positively absorbed by their work and fully committed to advancing the organization’s interests. Increased employee engagement thus represents a more difficult hurdle to clear. Although we’ve focused here on the role of work and employment in shaping people’s happiness, it is worth noting that the relationship between happiness and employment is a complex and dynamic interaction that runs in both directions. Indeed, an increasing body of research shows that work and employment are not only drivers of people’s happiness, but that happiness can itself help to shape job market outcomes, productivity, and even firm performance. Being happy at work thus isn’t just a personal matter; it’s also an economic one.